King-size granny square quilt at home on my bed. Kinda of mean to just give you a teaser, but I'm still trying to work out the best way to capture this king size quilt in a good picture. Thinking an outdoor shot would be nice, but wondering how well a mostly white quilt will stand out when it's still pretty white outside (not to mention the best way to bribe some much needed quilt helpers to hold her - they do not enjoy holding smaller quilts, so holding granny for a photo op will really raise their opposition... ;o). I promise to figure something out to show her off a bit better. Anyways, you now have some proof I finished her. Happy beyond words, that I can finally cross her off my first quarter 2014 Finish Along list. Yay! The winners have been announced, so I can uncross my fingers... and do a happy dance! 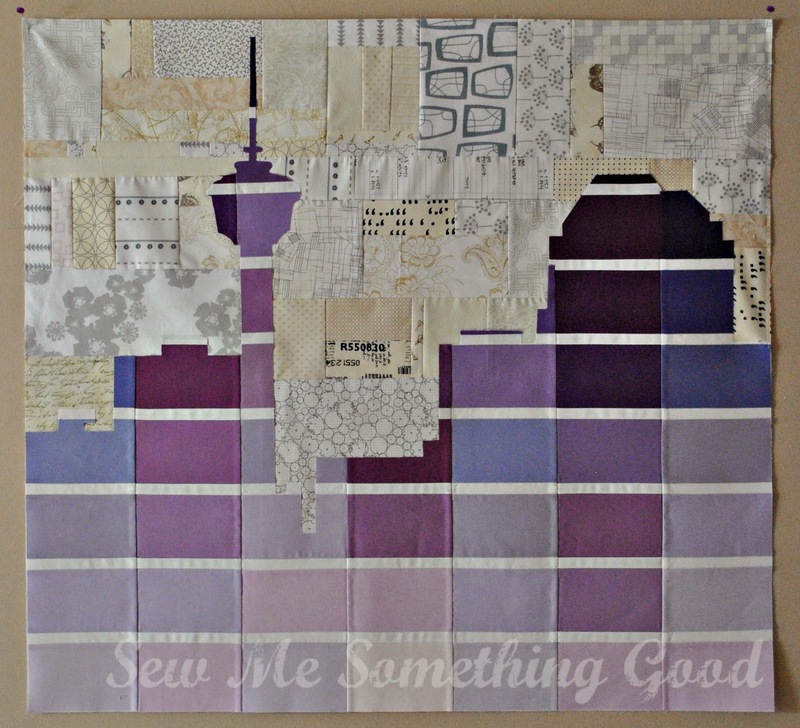 was chosen third place in the Tops Only category in the 2014 Pantone Quilt Challenge. Many thanks to Anne and Adrianne for organizing and working behind the scenes to make such a fun event possible. Way to go! Congrats to the respective winners - which leads to many thanks to the judges for their time and willingness to tackle such a task (can't imagine the difficulty in choosing!). Thanks as well, to the sponsors of the challenge for their amazing generosity. Plus, a very special thank you to each of you that took the time to vote in the challenge and for your wonderful comments of support. 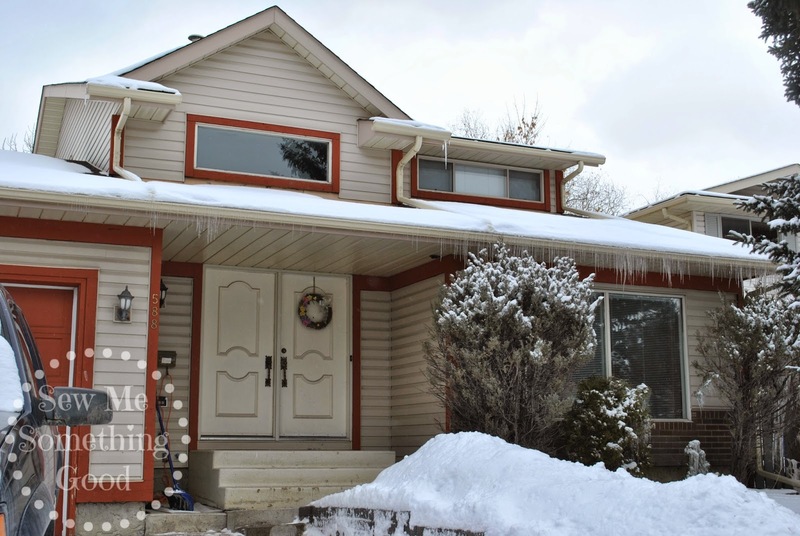 We've had snow fall for the past couple of days and despite the temperatures warming enough to get things melting again, it still meant having to shovel off the driveway and sidewalk. I will say I enjoyed the fresh air, but have to laugh at my Spring wreath on our front door when you consider the current landscape. 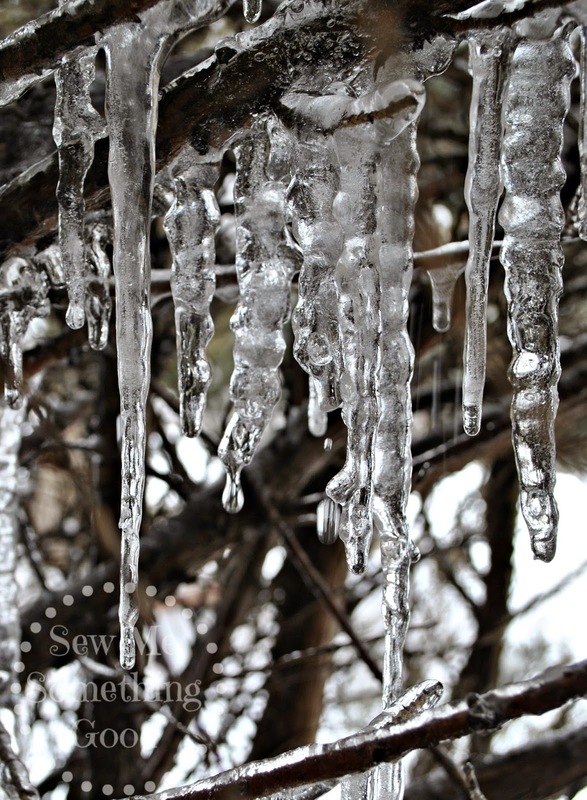 Lots of icicles and lots of snow. Yes, that's March weather in Calgary. 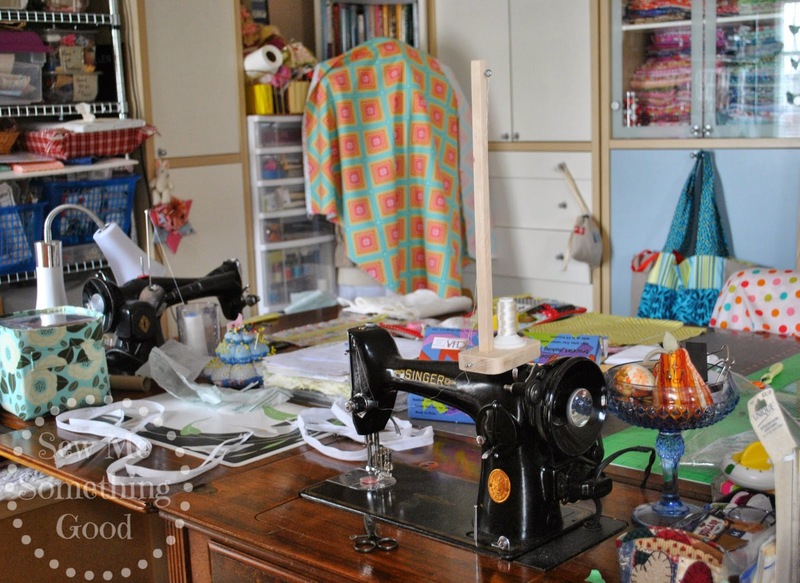 Inside my sewing room, I'm currently at work stitching a gift that I've designed (which is why you're seeing fabric draped on my sewing form, the chair and all over the table - just keeping it real ;o). Despite the current mess, I thought you might like to see the new set-up. Since discovering how handy the Singer 201 is for quilting (she rocked that king size quilt), I've left her stationed in the spot I used to have my 15-91 (aka: Belle). Belle has now been re-positioned to the end of my cutting table. Since each vintage machine is housed in its own table, it now looks as if my space has increased. Better yet, the new set-up means I have one machine ready to piece with the other ready for quilting. (Don't worry, I still have my modern machines. They are currently tucked away, but can be set-up when/if I need them.) I have to admit, I smile each time I enter my sewing room and see these two vintage beauties waiting for me. Belle is my Singer 15-91 seen in the background and Fancy is the Singer 201 in the foreground. It may be hard to discern but there are a few subtle differences between them. Fancy is larger, is belt driven and has a drop in bobbin (she's also sporting the thread rack my hubby made so that I can use cones of thread and keep a decent tension). Belle does all my piecing for quilts and since finishing a king-size quilt on Fancy - I've decided they make a pretty great quilt making team. Voting is open until 11pm PST on Thursday 27 March, by clicking the heart in the top right corner of your favourite entries on this post here. My entry, "Paint the Town" can be found in the Tops Only category. If you haven't already had a look at the entries, please go see them. I promise you will be inspired! It's a fabulous design and is perfectly suited for grabbing those layer cakes you're hoarding (and can't figure out what to make with!). To celebrate the launch of her newest pattern, Cheryl is generously giving readers a chance (well, 14 chances, actually) to win a copy of "Peanut Butter Pinwheels" and "Shoo Fly Pie". 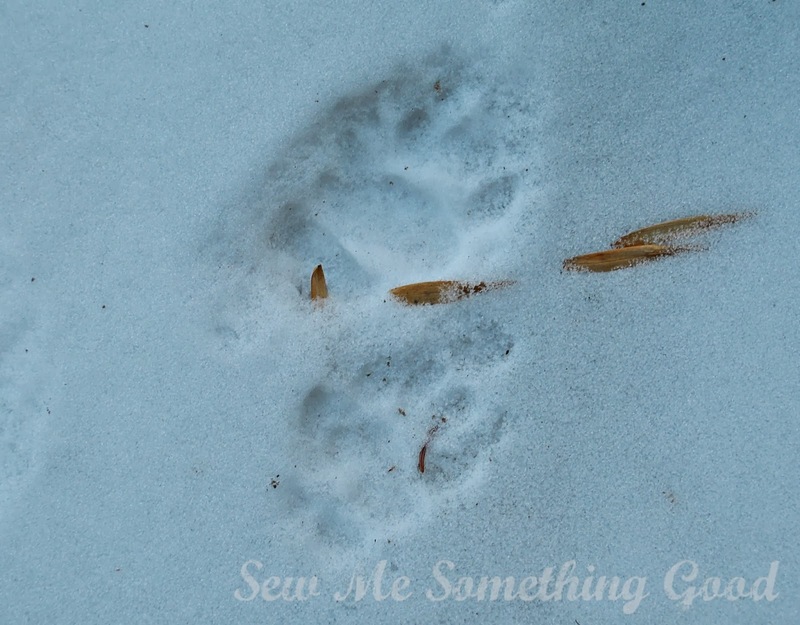 Anyways, please, hurry over to enter Cheryl's giveaway for your chance to win two of her awesome patterns. Now, for my last random bit for today, I thought I'd mention that Craftsy is having a Gone in a Flash Sale at the moment. It's a sale on supplies starting today and ending Friday, March 27th. and up to 75% off yarn. 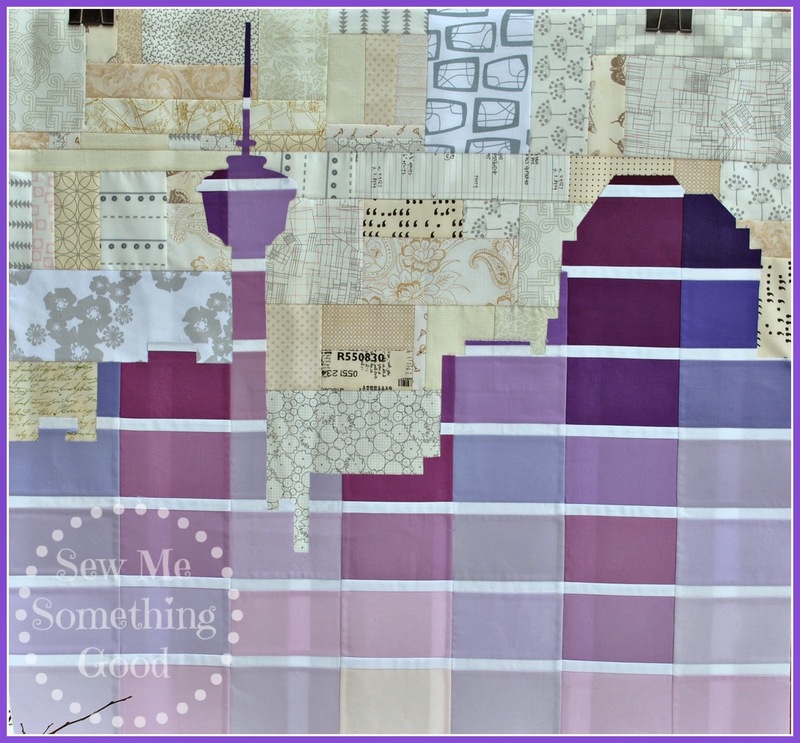 I thought I'd join the fun for the first time by linking up with Molli Sparkles' Sunday Stash being hosted this week by Kristel over at Work-In-Progress Girl . 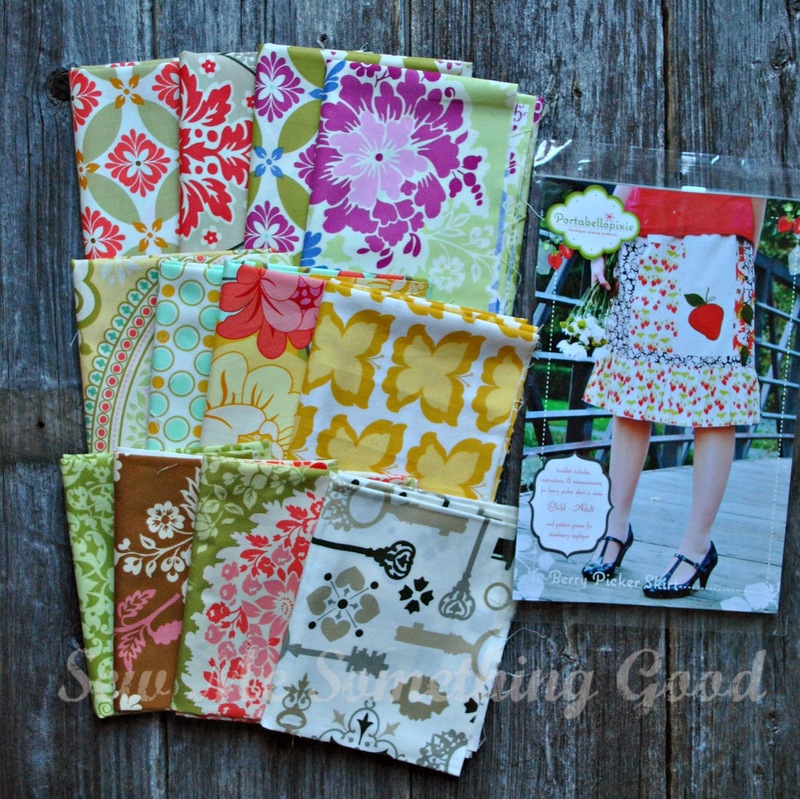 Top and bottom group of 4 are fabrics from Sandi Henderson's Secret Garden line. 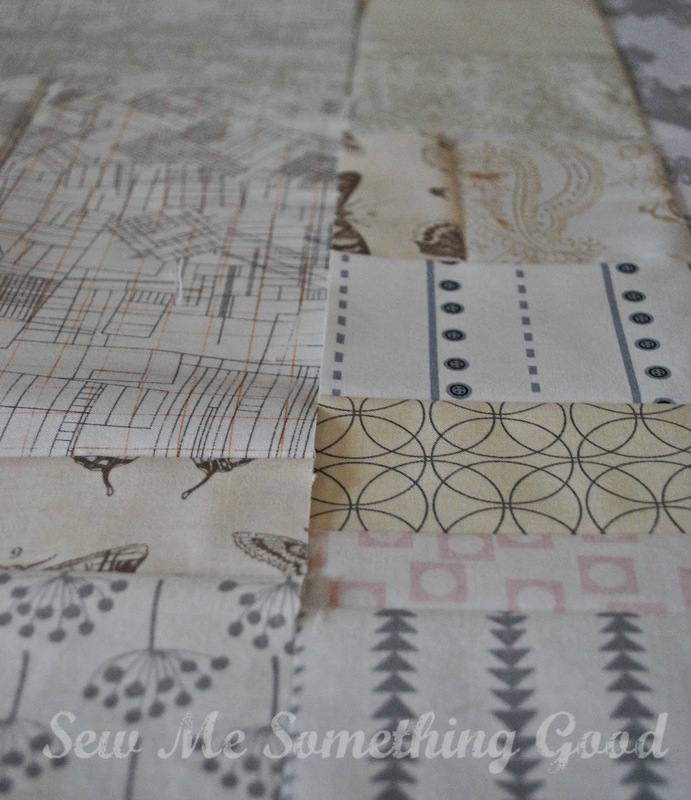 Middle group, far left is also from Secret Garden, while the other three fabrics are from her Meadow Sweet line. 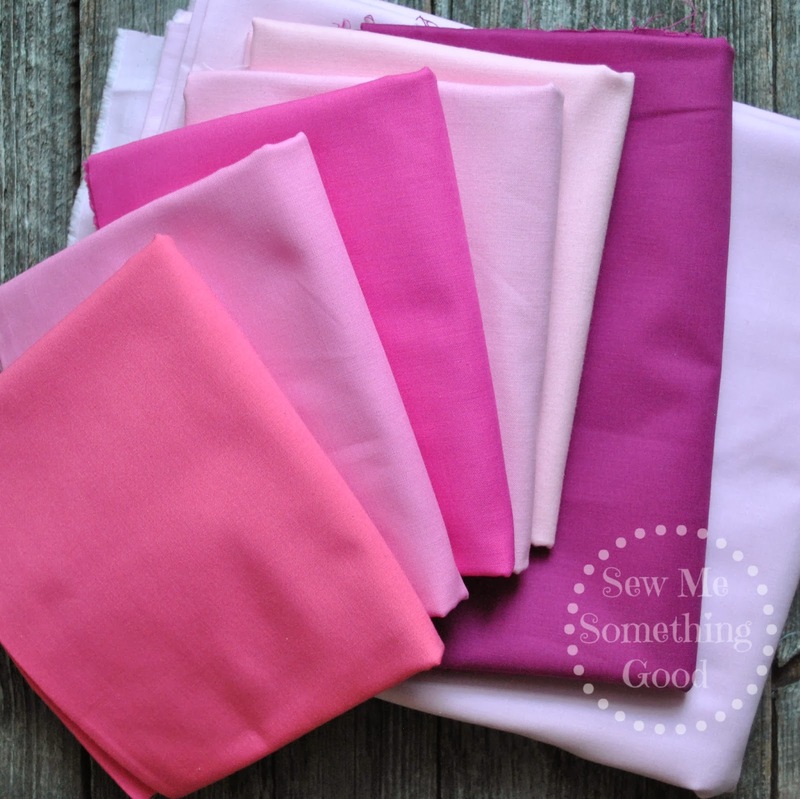 Imagine my delight and surprise to receive not only these yummy fabrics but her pattern for a Berry Picker Skirt (a sweet freebie!). Thanks, Sandi! and hope you will enjoy seeing more Sunday Stash shares. just click the link above and then scroll down to view thumbnails of each entry. Remember there are 3 categories, so you have one vote in each. Have fun choosing your favourites! for all their work in organizing this fun event. along with the talented judges and many generous sponsors. 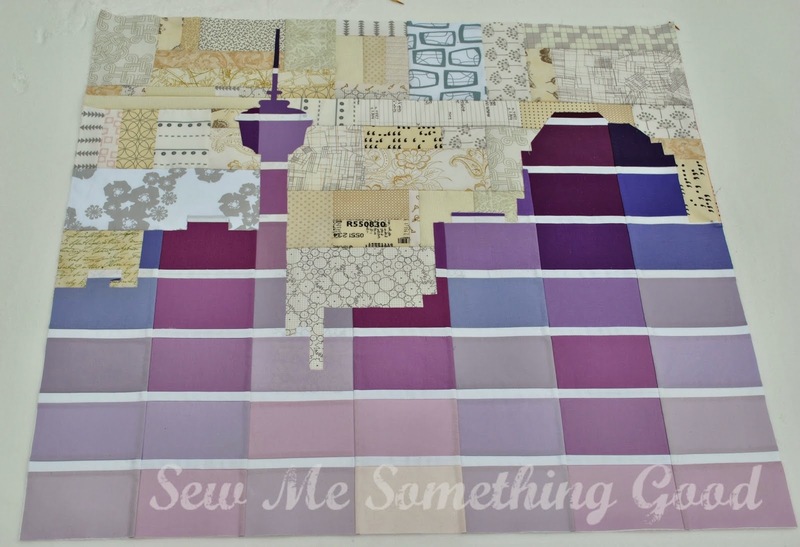 It's so exciting to see what everyone else has been creating with Radiant Orchid. Best of luck to all the entrants! My entry falls under the category of "Just the Top" ( I'm so thankful that this category exists!). To be honest, I sketched and played around with several design ideas before I found one that "clicked". 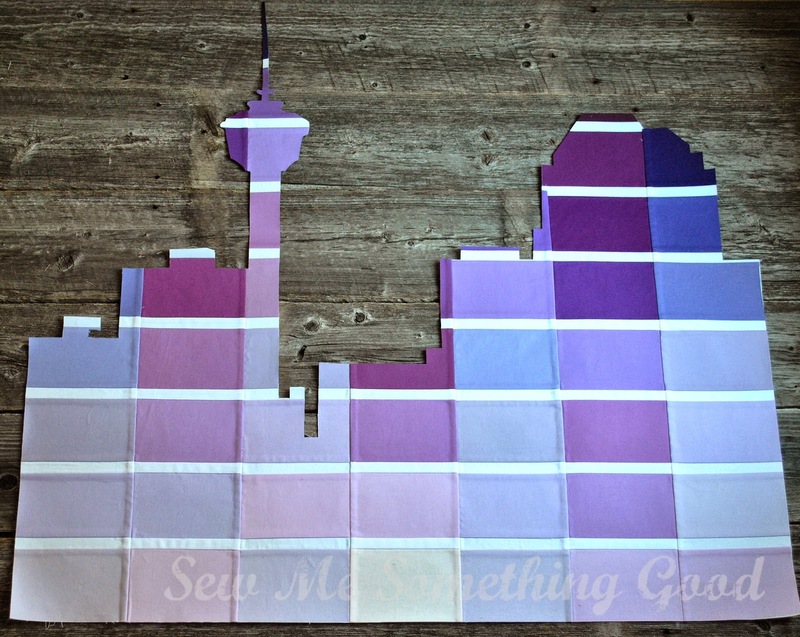 Paint the Town - featuring the Calgary Tower located in downtown Calgary, Alberta. My design features a small portion of the skyline of the city of Calgary, Alberta, where I currently live. 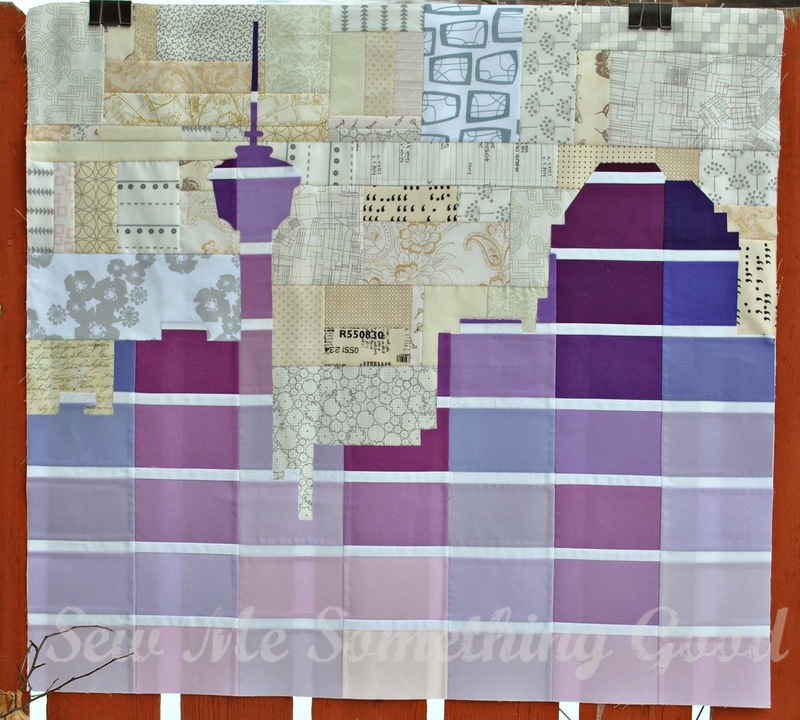 I was inspired to use all of the Kona purples available, to sew "paint chips" and then cut the shape of the skyline from them. It was a wonderful way to play with graduating values. See that slice of darker purple on the fullest part of the Calgary tower? It took a little math and careful planning to accomplish, but the effect was worth it! The lighting in this photo of the "paint chips" is most true to the actually colours. It seems that depending on the lighting, the purples can either look more pink or more blue. 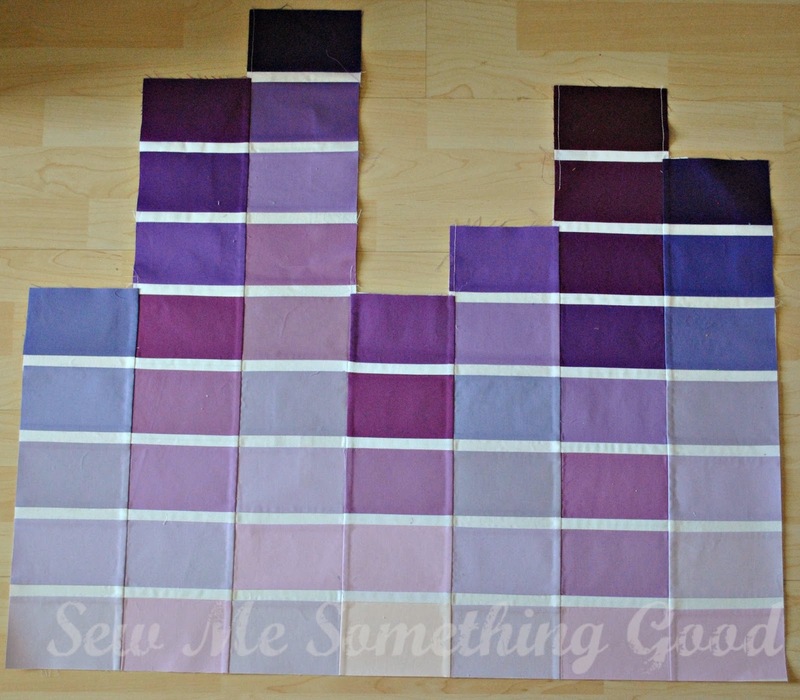 Pictured above- the "paint chips" after piecing and below is the photo of the applique I made from them. Bringing it all together, is the background mix of low volume fabrics. I wanted the outline of the buildings to contrast with the sky (which is why the darkest values are at the top) and I also thought it would be more interesting to have the background comprised of prints to play off the solids used for the paint chips. This pale sky also seems to embody the nearly year round prospect of snow which is a part of living so high in elevation and so close to the Rocky Mountains. Paint the Town resting on fresh snow! Viewed in natural lighting, you can get a better comparison of the range of those Kona solids. 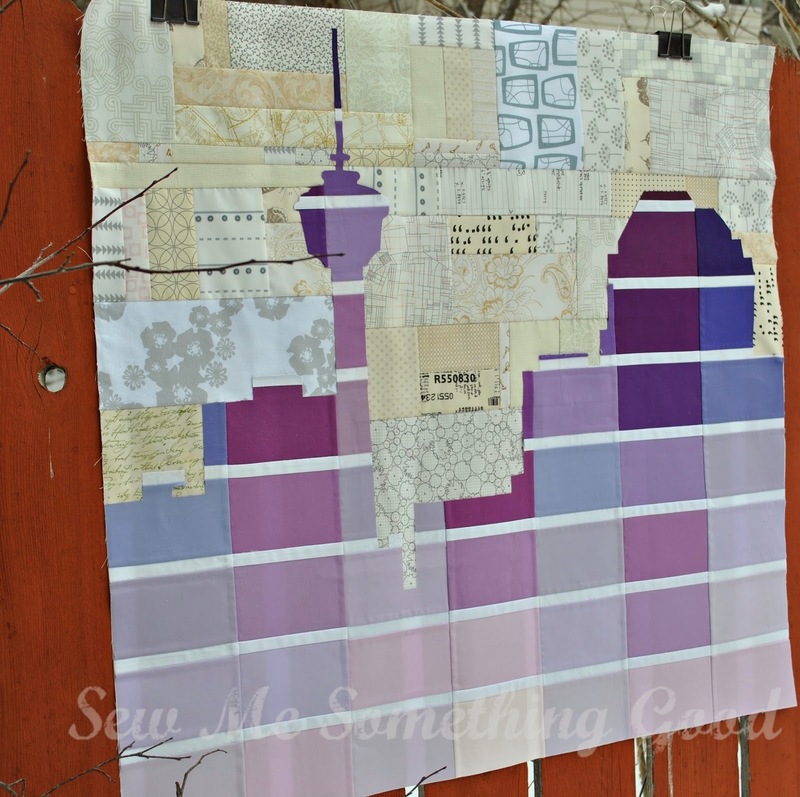 This challenge pushed me to use a colour that was virtually non-existent in my stash (that has obviously changed! ;o) and it has shown me that sometimes simple lines are all that's needed in a design. Thanks so much for stopping by to take a look at my entry for the Challenge and letting me share a bit of my process with you. Enjoy the rest of the entries! I'm linking my entry here. Seriously, those half off prices have me thinking it's time for class! Which class (or classes) would you be interested in taking? I've got my eye on this one and this one. They both look like fun and a great way to improve my skills and knowledge (while saving money ;o). In keeping with NQD, I'm finishing up my king size granny square quilt (I'm at the boring part - working in those thread tails... bleh... but so close to being able to show it to you). 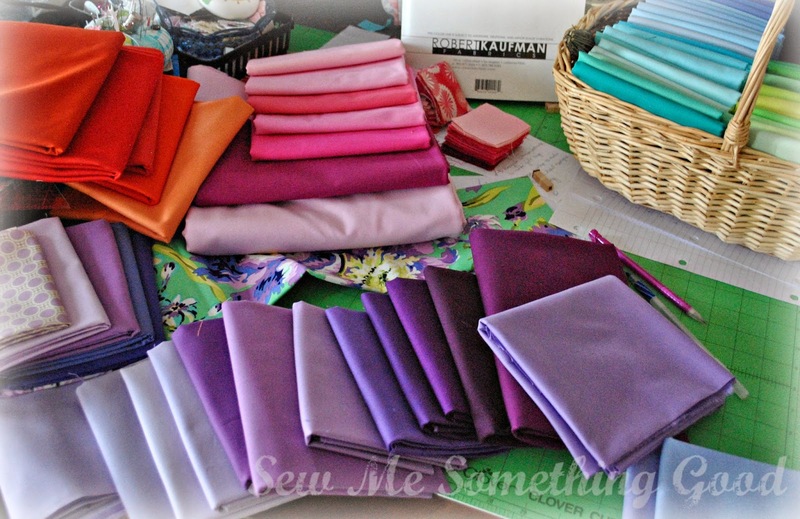 Plus, I'm also hoping to celebrate (or reward myself) by diving into these yummy purple Kona solids for a new project. Yay! 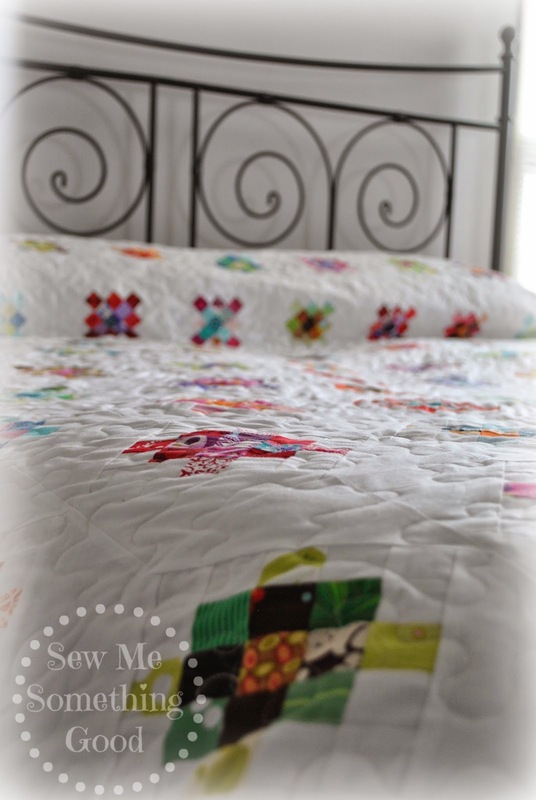 Free motion quilting on a vintage Singer 201! The free motion/darning foot is designed for use on low-shank sewing machines and I picked mine up at my local quilt shop. I bought it for use on my Janome MC 7500, but discovered it would work on my Singer machines if I added a small square of metal (which my hubby fashioned with a hole in its center) to fit between the foot and the bar on the machine that foot is attached to. 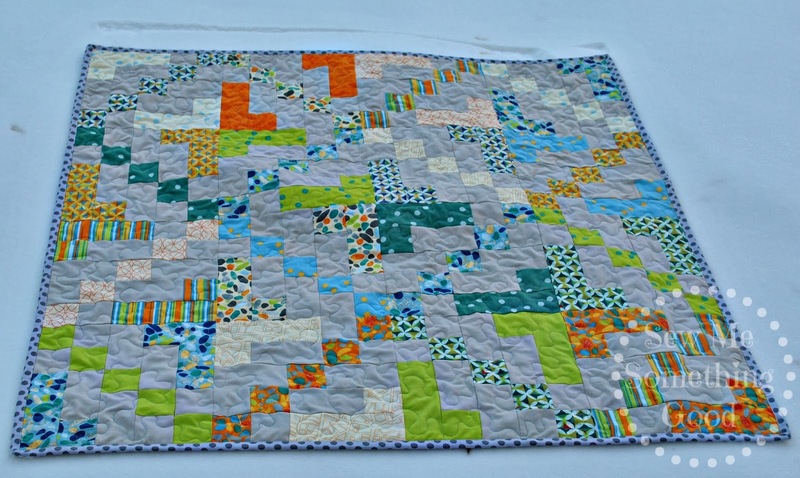 The quilting has not been half as daunting to undertake as I thought it might be. Yay! Still, it takes hours to quilt a king-size quilt on a domestic machine (as you can imagine it would), but it is possible to do. If you look closely at the photo, you may notice that I instead of using the open toe attachment on my free motion/darning foot, I opted to use the clear disc toe. All my practice quilting beforehand lead me to this change as I discovered that it was better suited for smoothly gliding across the seams in those mini granny square blocks. Now with a bit more determination, I may just have a finish to share soon. 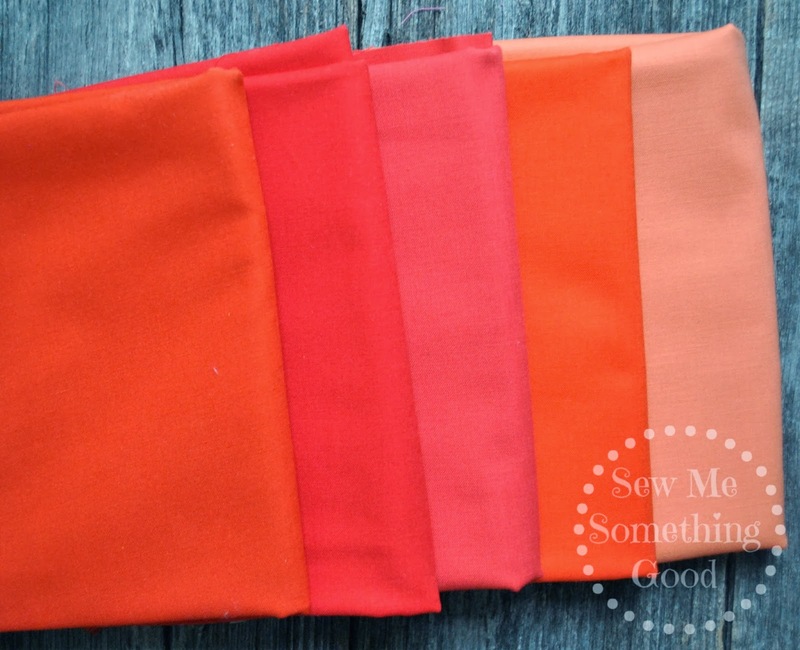 and orange/reds to be added to my growing solids stash. You can't imagine how distracting these new beauties are, but I've promised myself that I absolutely must finish something (ahem, such as my king size granny square quilt), before starting another project. Prints left on our deck by a night time guest. Explains the awful smell in the middle of the night and why I nearly smothered myself in my pillow trying to escape the stink. I've got a fun little finish to share and two talented friends to thank. 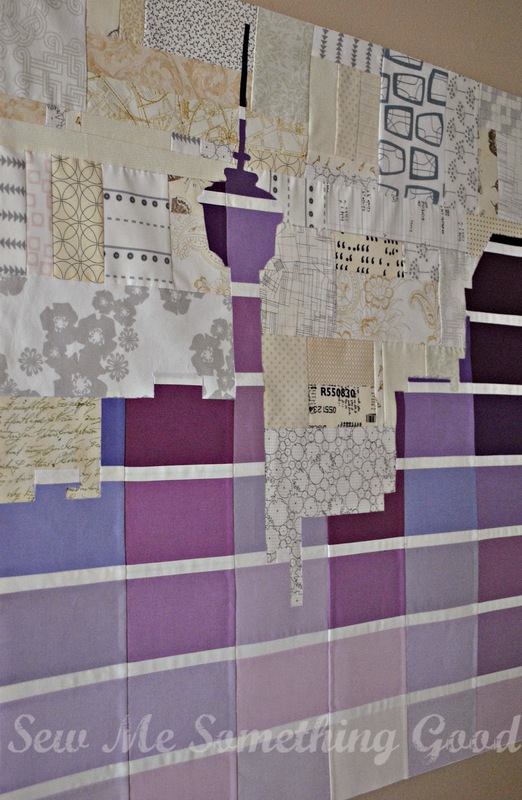 (this is her Barcelona line and these were her studio scraps - how cool is that?!). 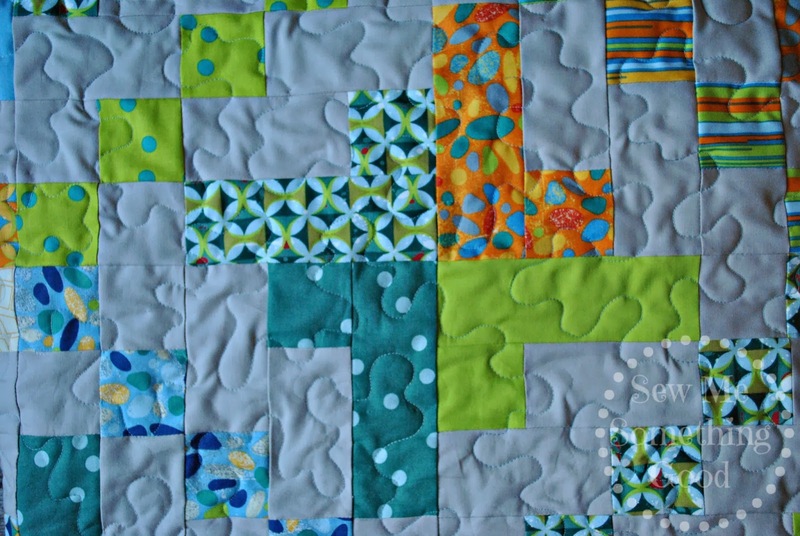 I think using Brigitte's fabrics to make a modern quilt for a baby boy means lots of bright colour without it being "babyish". Barcelona, Baby! 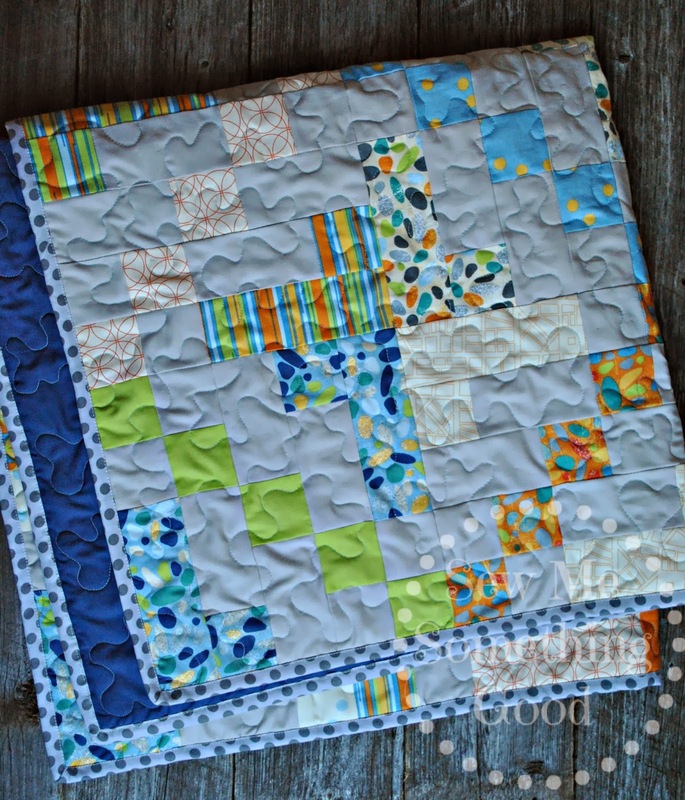 Pattern is On a "Jelly" Roll, designed by Cheryl Brickey of Meadow Mist Designs. 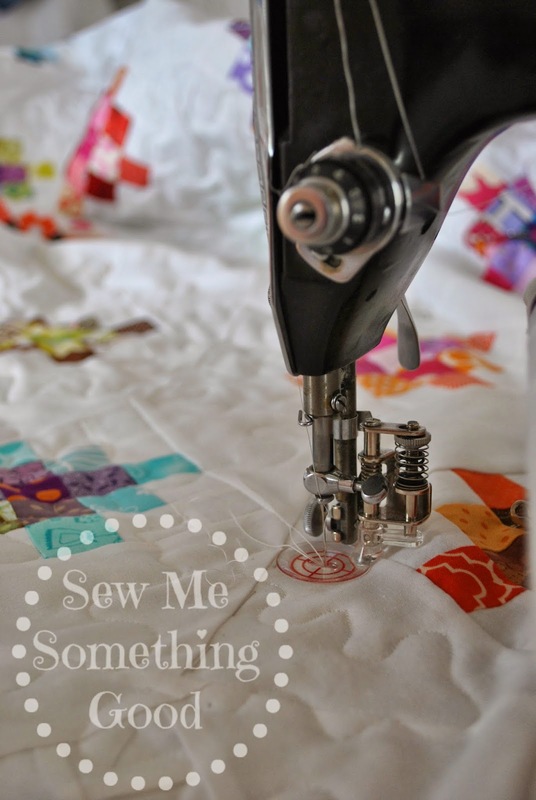 I was so happy to be able to combine the talents of my friends and to have a chance to try some free motion quilting on another one of my vintage Singer sewing machines. 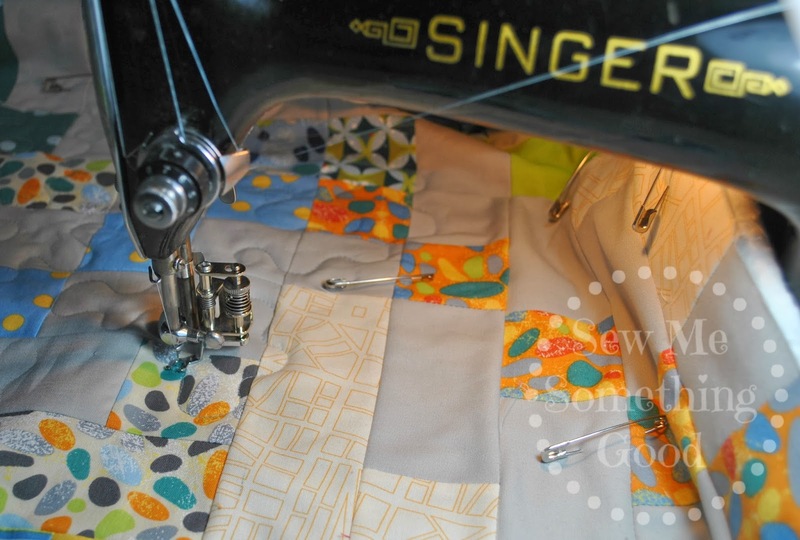 I always piece on my Singer 15-91 and normally, I quilt on my Janome MC 7500, but I decided to set up my Singer 201 and see how she would work for quilting. The free motion/darning foot I'm using is for a modern, low shank machine. This foot does not rest on the needle bar, has no plastic parts to it, has an adjustable spring and other interchangeable pieces (a closed toe and clear, wide plastic toe along with the open toe shown in photo). It is an awesome attachment and well worth the money I spent to buy it. Works equally great with my Janome MC 7500 or with my vintage Singers. I have used the 15-91 for quilting on small items like pillows, placemats and bags, but wanted to try on a larger project with a larger vintage machine. The 201 is only slightly larger than the 15-91 (both in distance from the needle to the body of the machine and in height from machine bed to body) and the fact that both machines are housed in cabinets make them perfect candidates for quilting. I also love that both the 15-91 and 201 can have their feed dogs dropped to make free motion quilting on them possible. Previously, I discovered that I can use the free motion foot I bought for my modern Janome on my 15-91. However, it does have to be slightly adapted, so that the foot would be centered with the needle (because you cannot adjust the placement of the needle on the vintage machines and this modern foot will not have the opening centered with the needle without some adaptation. My husband fashioned a piece of thin metal with a hole in it, which boosts the foot further away from the post the foot attaches to on the machine. It works perfectly!). Once I got my settings adjusted, making smooth curves worked nicely. 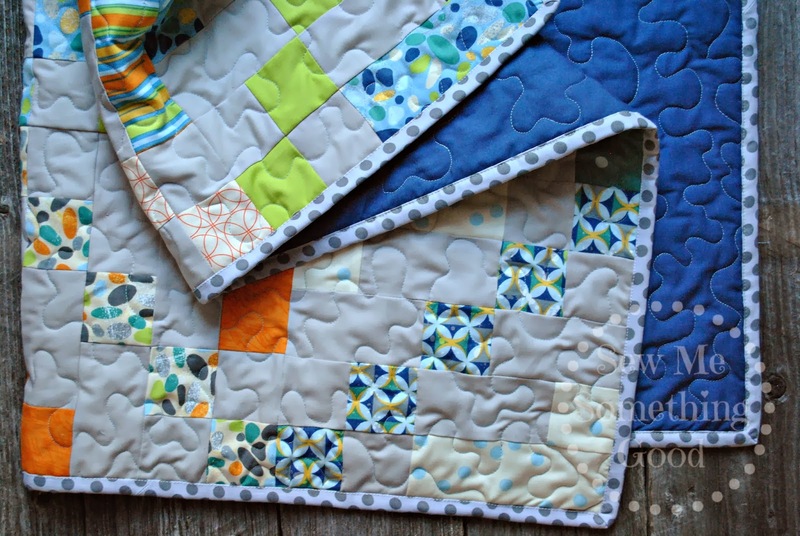 The texture this style of quilting adds, will really pop, after the quilt has been laundered. I played around with stitching loops and whirls on a scrap test piece but settled on some meander quilting for the texture it gives. 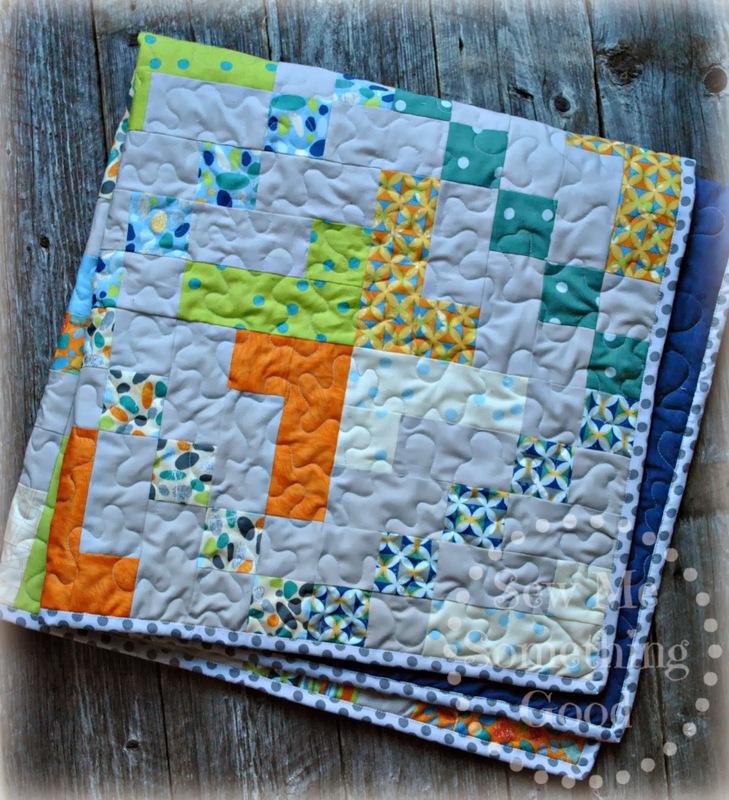 I love meander quilting! 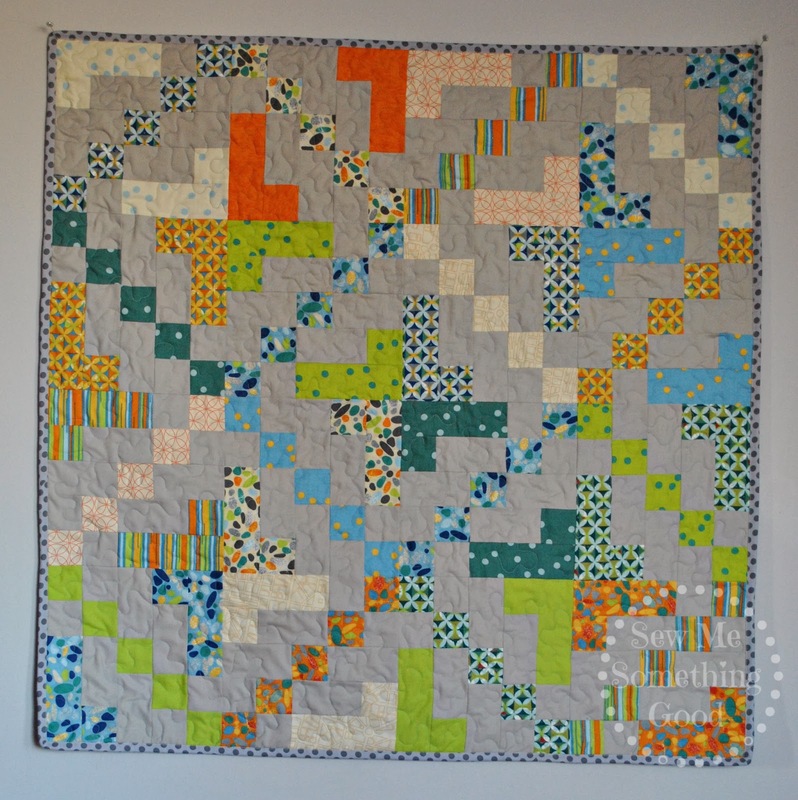 I used a variegated 50wt blue/grey Wonderfil thread for the front and back of the quilt. This baby quilt was the perfect size for helping me get a taste of using my Singer 201 for quilting and am pretty satisfied with my initial attempt. Once the quilting was complete, I machine stitched on the binding (because a baby quilt will certainly receive a lot of washings... ;o).